The first episode of the new RTÉ Radio 1 science show ‘What’s it all about?’ was broadcast last night with an exploration of the brain. How it works? What happens when it doesn’t? And lots more including how science and neuro-imaging technology detects the brain changes from mindfulness. Some background sounds from Joanne O’Malley of Mindfulness at Work guiding a meditation were recorded and included in the programme, to give the audience a sense of what happens in a class. If you’d like to hear the show, you can stream / podcast from here or from RTÉ. Up until recently, it was believed that the brain developed during childhood and adolescence but was hardwired in adulthood. Thanks to the explosion in brain research and neuroimaging technology, we now know that the mind bogglingly complicated brain is constantly changing and has an amazing ability to be modified, re-shaped, re-wired at any stage. Depending on our experiences, the thoughts we think, where and how we focus our attention – all of this impacts the neurons that fire and wire together and the neural pathways created; all of which determines the physical structure and the functional organisation of the brain. The realisation is that we have much more control over our brain’s development than we ever imagined and this is unbelievably exciting! 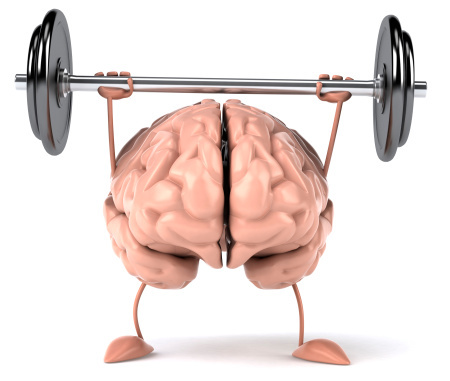 Neuroscientists use the analogy of weight lifting to build muscle mass to describe the way mindfulness meditation changes the brain. In a similar way to exercising, focusing attention makes an area active, which grows ‘grey matter’ or neural mass. Neurological research on the processes and effects of meditation has shown substantial brain and body changes as a consequence of regular meditation practice. Functional MRIs and EEGs are used to detect these changes. One man determined to show the world how meditation can alter the human brain and improve peoples’ happiness is Matthieu Ricard. 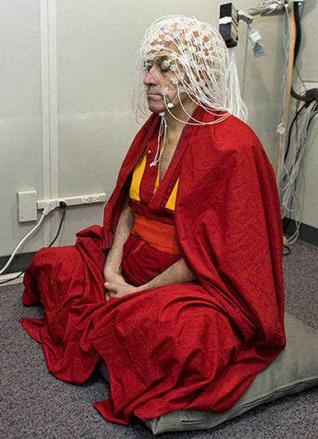 This is a photo of him undergoing an EEG test while meditating. He acquired the title of the Happiest man in the world when his ‘beautiful’ brain showed a capacity for happiness and compassion never before seen in science. The scans also showed a reduced propensity towards negativity and enhanced ability to focus and maintain attention. Brain changes from Mindfulness – even a little! Studies have shown that even an 8 weeks mindfulness meditation course produced changes that resulted in significantly increased positive emotional states and the ability to focus and maintain attention as well as some protection from the affects of aging. It seems as if we have come full circle. Science is confirming what meditators have known for centuries. Practicing meditation not only improves mental and physical health but it also shapes our brain for wellbeing, so we can ‘see more clearly’, feel happier and more content, experience inner peace & equanimity as well as compassion and connectedness. The practice does require active engagement but it sounds like a bit of a no brainer, doesn’t it? This blog was written by Joanne O’Malley, Mindfulness at Work. If you’d like to hear the show, you can stream / podcast from here or from RTÉ.